Annual services at the Greek Orthodox chapel of Saint Barbara have lately attracted hundreds of congregants, especially since founding of the Greek radio station that advertise the feast day. That the Greek community make pilgrimages to the sacred site to celebrate St. Barbara’s feast day, which falls in December, is testimony to the popularity of the holy temple. Indeed, it was described that “on encountering it, one overflows with feelings of patriotic and religious emotion and pride”. Originally a private chapel, it is now regarded as an exoklesi (country chapel). 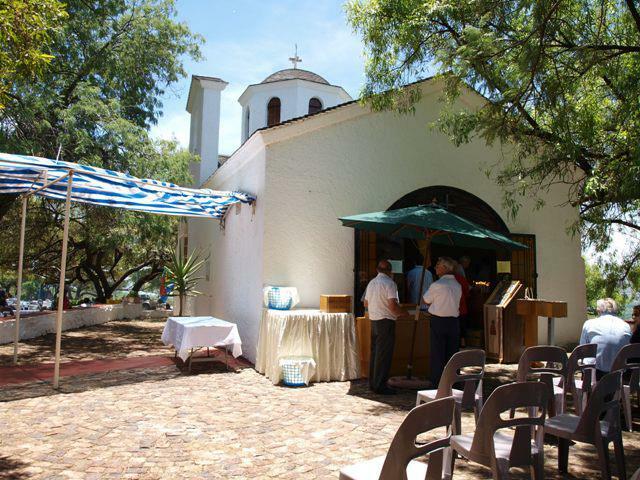 Located on the farm Scheerpoort, the chapel graces the southern foot of the Magliesberg mountains (See figure 1). It is situated five kilometres as the crow flies due west from the western tip of Hartebeespoort Dam (See figure 2). St. Barbara was built in 1952 by Evanghelos Nomikos (See figure 3), a ship owner, who is also the benefactor of the Greek old-age home in Johannesburg (See figure 4). The history of the chapel has been reconstructed primarily from interviews and by reference to the few recorded sources. Here, then, are the motives of a religious family who built a beautiful holy temple; the actions of a religious committee intent on perpetuating Greek Orthodoxy; and the deeds of a religious flock determined to make an annual excursion to their chapel miles away from any town. Evanghelos Nomikos with his family fled to South Africa from Greece on a troop-ship during the early part of World War II, possibly in 1941. Nomikos seems to have prospered during the war for he bought five Liberty Ships in 1947. These he named after presidents of the old South African Republic: President Kruger, President Steyn, President Reitz, President Brand and President Pretorius. From 1950 to 1951 Nomikos bought 18 farm portions situated on the northern half of the farm. In September 1951 he purchased the biggest portion, which measured 850 hectares (See figure 5). The reason that Nomikos senior decided to buy a farm was to feed the crews on the his ships. Nomikos asked a relative, Dr. Platon Paliatseas, who was a lecturer in agriculture at the university at Thessalonike, to manage his farm (See figure 6). Paliatseas came from a distinguished family; his father had been a rector of the university there. Platon, too, was highly regarded: in 1939 the Academy of Athens awarded him the Emmanuel Benaki Prize for his book on combating insects in agriculture. Nomikos specified that the selected farm had to meet three criteria: it had to be next to a river, alongside a train station and close to Johannesburg. Obviously the river would provide the water to irrigate his crops, presumably he would rail his produce to the coast where his vessels docked, and as the Nomikos offices were located in Johannesburg, the proximity of the farm would allow close supervision. Paliatseas arrived in 1949 and, after viewing many farms, selected Scheerpoort. Nomikos spared no expense. He promptly invested mauch capital in the farm in the form of an inordinate amount of machinery. The farm had some recreational facilities, in particular horse riding, a tennis court, a swimming pool, and small game hunting (guinea fowl, rabbits, etc.). This attracted many visitors over the weekends, at times to excess. However, he soon found that farming was unprofitable. Nomikos lost interest, in 1961, he transferred the farm into the name of his son, Apostolos, who was known as Laki (See figure 7). Laki, who arrived at the beginning of 1957, diligently took up farming (See figure 8). Later he employed managers to run the farm, but he experienced endless trouble with them. This was the main reason Laki gave up farming, and decided to sell the farm in 1964. Two reasons abound for building the chapel. According to the father, Evanghelos, there was no question of a vow, or tama. According to the son, Laki, it was solely a question of a vow. There is sufficient additional evidence, however, against the view that the chapel was built in fulfilment of a vow. The first decision to build a holy temple is based on the family’s religious persuasions: they believed in St. Barbara. Apparently St. Barbara was the church that the father had attended in Santorini, his birthplace. According to Laki, his father had vowed that he would build such a chapel upon his daughter’s recovering from an eye condition. Apparently the younger daughter, Effie, of Nomikos and his second wife, had a “ lazy eye”. After a minor operation, and with the arrival of contact lenses, the condition was corrected. Also, it is believed that the operation took place after the chapel was built. This reason for building the chapel, therefore, seems to be doubtful. The foundation stone of the chapel is built, unusually, above the main entrance (See figure 9). The chapel (See figure 10) is of typical Byzantine architecture, based on a model of the Hagia Sofia in former Constantinople. St. Barbara was designed by architect John Philippopoulos, a childhood friend of Nomikos. Phillippopoulos, who was also an artist, not only designed a beautiful chapel, but created an almost acoustically perfect building. Perfect white, built high up the valley, endowed with a beautiful view, and visible for many kilometres around, the chapel stands in sharp contrast to the dark green background of the Magaliesberg countryside. The chapel can seat 50-60 congregants. A velvet bishop’s chair, in the typical blood-red colour, stands at the southern wall. Two icons hang on the north wall, another two on the north-western pier (or column) (See figure 11). The road to the chapel skirted the western farm boundary fence for about two and one-half kilometres uphill before it turned eastwards and headed horizontally towards the chapel (See figure 12). This road was in use until about 1992. Owing to the difficulty in maintaining it due to potholing, the farm owners built another road, and yet a third, which a committee – the Committee for Saint Barbara – funded. In 1954 Sophia Hamilothori was married to Paliatseas in the chapel by Archbishop Nicodemus Zacharoulis ( See figure 13). This was the only wedding in the chapel. The years in which liturgies were conducted in the chapel can be divided into four phases: the Paliatseas era, from 1952 to 1957; the Nomikos junior era, from 1957 to 1967; there then followed nearly two decades of oblivion, from 1968 to 1986; and resurrection followed from 1986 to the present. During 1952-57, the Paliatseas would go weekly to the chapel and the faithful would arrive at St. Barbara from Pretoria on 4 December every year. From 1957-67, annual services were conducted by archimandrite and psalti of the Greek Orthodox Church in Pretoria. The congregants would afterwards drive to Laki’s house for lunch. 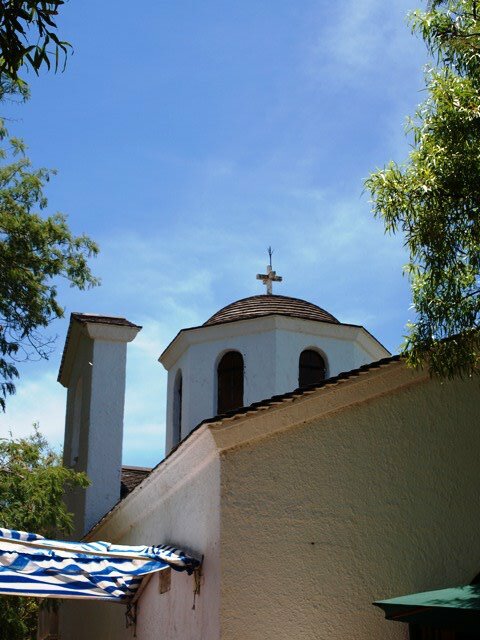 After Laki left the farm in 1964, various priests from the Hellenic Community of Pretoria would hold liturgies and make arrangements for water and other necessities. Always, they would first telephone Mrs. Tassia Capitani, the only Greek resident at Scheerpoort, who held the keys to the chapel from the 1950s until a few years ago. She would also arrange to have the chapel cleaned beforehand. The huge farm portion on which the chapel was built was sold in July 1968 to Debra Libanos (Pty) Ltd. Apparently Evanghelos Nomikos did not want the chapel to be included as part of the property. Also, some members of the Hellenic Community of Pretoria had expected that St. Barbara would have been bequeathed to the community. When Laki drafted the deed of sale he, to a large measure, followed the advice of the archimadrite of the Pretoria church. He had told Laki to add a special clause guaranteeing the free use of the chapel and the road leading to the chapel for congregants and priest. Debra Libanos is an important historic monastic centre 80km north of Addis Ababa in Ethiopia. It belongs to the Orthodox Church of Ethiopia, which, from 1959, started to fall away from the Coptic Orthodox Church. According to the shareholder of Debra Libanos, Laki apparently deconsecrated St. Barbara. This was done sometime before the chapel was bought. How it was done is not known, neither is it known why he did this, but it is suspected because of some discord that temporarily existed between him and his father. No services were held-neither Greek Orthodox nor Coptic Orthodox-while the farm portion was in the name of Debra Libanos. The reason for choosing an Ethiopian church above any other was that the buyer of Debra Libanos had spent time in that country. She was not of the Ethiopian Orthodox faith, and it was not a condition of sale that the church be deconsecrated. The farm portion was bought because its buyer like it. At the time she was living in Bryanston, near Johannesburg, and used the chapel as a house for shooting parties, mostly to shoot birds. There were braai’s and the guests milled around in the former chapel. This continued for three years, until about 1971. The sum of R80 000.00 paid to Laki for the farm in 1968 enabled him to return to Greece. It appears that Laki had a change of heart in deconsecrating the chapel for not only did he rename and suffix all his ships with the letters S.B (See figure 14), which stood for Saint Barbara, but also named his daughter, Barbara, after the saint. Ironically, the person indirectly responsible for the chapel’s resurrection was not Greek. Junita Joubert, writing in the weekly edition of the newspaper Bosveld-Beeldof 1 July 1982, published an article with two large colour photographs. Here she described the approximate location of the chapel and the reason, albeit obscure, for its erection (See figure 15). Noticing the article, Themistoliks Rodakis of Rustenburg, after several attempts, discovered the chapel in 1986 and attempted to resurrect St. Barbara. Hearing of the chapel, a few Greeks rallied to help. Although its doors were intact, there was no church bell, the windows were broken and the chapel was empty. Panaghiotis Dalkas and his wife Aphrodite of Rustenburg replaced the windows, repaired the front door, supplied a votive lamp and the icon of St. Barbara, and painted the chapel in 1986. Finally, the first liturgy, after nearly twenty years of oblivion, was held on 16 December 1986. Laki visited the country and the chapel in 1987 and was pleased to see that it had been revived. Laki even paid for buses to take congregants to the chapel. Repairs, maintenance and replenishment continued. In 1991 the road alongside the fence was repaired. Then, in 1992, Stavros Konidaris of Roodepoort steeped in and undertook an unprecedented amount of work to restore the chapel. In 1992 the iconostasis from St. Nektarios, in Orange Grove, was moved to the chapel. It is still here today. In 1997 the Hellenic Community of Pretoria made unsuccessful attempts to hold services at the chapel. In the same year a committee- the Committee for St. Barbara-succeeded in obtaining permission from Archbishop Paul Lingris to hold an annual service there. The Hellenic Community of Pretoria supplies about 30-40 tables and 400 chairs for the event. After liturgies national dances take place alongside the church. The chapel is faithfully maintained. Much effort is devoted to organising the annual event. The proceeds are used to fund a bursary, which currently supports three needy Greek university students. The committee in addition have built toilets, led piped water, cleared the area of rocks, levelled the site for parking and built a souvla (braai). The chapel of St. Barbara on the farm Scheerpoort is considered an example of an exoklesi – a “chapel at a distance from a town church”. There ia another chapel of St. Barbara at the church of Saints Anargyron in Triomf, Johannesburg. This, however, is an example of a parekklesi – a “chapel alongside a church” (See figure 16). According to extant legend, Barbara was secretly baptised (See figure 17). For Dioscorus, her father, this was sacrilege worthy of death. Drawing his sword to strike the blasphemer, she was miraculously transported to a mountain. At this point of the legend, before he caught with her and handed her to the prefect Marcian, we will leave the legend and return to it in a moment. De Wetsnek is situated on the crest of the Magaliesberg directly above the chapel of St. Barbara (See figure 18). In the Second Anglo-Boer War of 1899-1902, during the first five De Wet hunts, General De Wet was unable to cross the Magaliesberg southwards to safety at the usual mountain passes (See figure 19). This was because they were well guarded by the British . By sheer necessity he and his 245 men, who had to lead their horses, managed to cross the range at the excessively difficult nek (raised pass) above the present-day location of St. Barbara. Was he, like Barbara, miraculously transported-but in his case-overa mountain? Finally, some words on John Philippopoulos, an architect extraordinaire (See figure 20). He first studied at the Polytechnic Academy in Athens at the Ecole de Beaux Arts in Paris. Here he won the Prix de Rome, a prize in his graduating year, for his design proect on Aegean architecture. He immigrated to Johannesburg in 1947 where he stayed and worked for the rest of his life. Some of Philippopoulos’s more memorable projects were the Cavinist Church, hewn out of the local rock, in Maseru, Lesotho, which elicited favourable reviews. He enlarged the Church of Saints Constantine and Helen in Johannesburg. Other than churches, the architect, who was very creative, designed many exclusive houses. A villa he designed in lower Parktown later became the Bensusan Museum of Photography. The curtain walls he designed for the Ritz Plaza in Johannesburg were the first of their type in the world. Considered a Francophile, he was a founding Member of the Alliance Francaise in Johannesburg. On his death, he was cremated, his ashes were taken to his motherland, and they were scattered, as he had willed, over what had to be his beloved thalassa – the Aegean Sea. David Panagos of Pretoria is here acknowledged, for in 2000 he showed the author the position of the St. Barbara chapel on a map, which the latter had been searching for the past 43 years. This history is based on a 15-minute talk that was broadcast in English over the Greek radio (New Hellenic Voice) on 23 March 2001. It was one of the 29 papers presented at the International Conference, “Orthodoxy in Africa”, organised by RAU, and others, during 22-25 March 2001.